Clarke and Stuart’s store occupied the last bay at the western end of the N S Hoffar designed Dunn-Miller Block – so in the Miller end of the building – at 28 Cordova. They started up in business early in the city’s history. H P McCraney in conversation with Major Matthews in the 1930s recalled General J. Duff Stuart and Harold Clark as both being clerks working for Seth Tilley, the owner of the stationery company that was established in Granville, before the great fire and the name change to Vancouver. Tilley had the first telephone in town (which if you think about it had somewhat limited utility) – although his telephone number in 1890 was ‘3’. (Nobody had ‘1’, but somehow A G Ferguson had managed to get ‘2’). After he rebuilt after the 1886 fire, Tilley’s store was at 11 Cordova Street. If his name was initially misprinted as Clark, Harold Clarke arrived in the city in 1890. He apparently arrived in the province from his native St Andrews, New Brunswick, in 1888 when he was aged 26. James Stuart arrived in 1889 and showed up in the directory in 1891 (although there was another James Stuart already in the city, working for Oppenheimer Brothers). Stuart was born in Dufftown in Scotland and 1891 Clarke was working for Thomson Brothers, booksellers and Stuart was a bookkeeper, although we don’t know who for. Clarke married in 1891, and Stuart in 1893, and each had three daughters. Stuart had four sons, Clark had three. By 1894 both men were working for Thomson Brothers, but in 1895 they had established Clarke and Stuart, booksellers and stationers in 11 Cordova Street, so presumably had bought out Seth Tilley who was still in town, but in retirement. 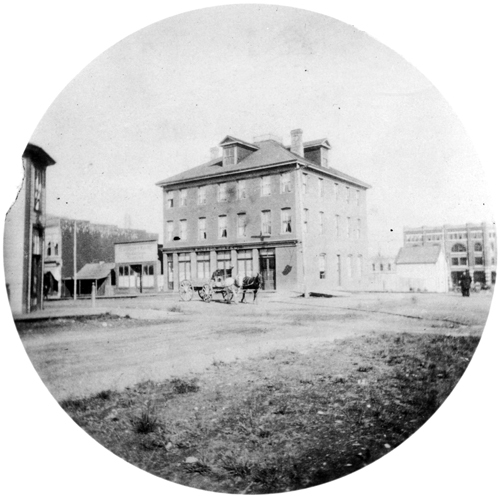 In 1896 they were at their new address, 28 Cordova (the building seen in this 1898 picture). Thomson’s continued in business too, but moved a little further up the street. Harold Clarke became President of the Recreation Park Amusement Co, a Licence Commissioner, and a member of the Vancouver Club and the Yacht Club. He lived at 1246 Haro Street. James Duff Stuart, who was four years younger than his partner, became the lieutenant-colonel commanding the 6th Regiment, later a General and at his death (in 1936) a Brigadier-General. In 1933 he spent $35,000 to buy equity in the Gleneagles golf course on the north shore. He was a member of both the Terminal City Club and the Vancouver Club. He lived at 1220 Georgia Street. By 1904 the company had moved past just supplying typewriters – they went one step further and provided the stenographers as well. Later they diversified into property development – to our surprise they seem to be the clients who developed the now demolished Devonshire Hotel on West Georgia Street. We’ve also seen the building they built for their printing works and store in 1906. The company continued in business for many decades – Al Purdy, the poet, remembers Clarke and Stuart printing an early volume of his poetry in the 1940s, and the company were still trading in the 1950s. As we noted when looking at the other end of the building, the Army and Navy store now occupies the space, although only the first few metres of the store are original construction, the remainder having been rebuilt in the early 1970s. We visited this same corner in an earlier post, when it occupied by the Empress Theatre. We thought that after the theatre was demolished in 1940 the site sat empty until this commercial block was completed in 1987. This 1979 image seems to confirm that belief. The rezoning sign on the site identifies the future building’s architect as William S Tong, and the developer as Harry Fan. You can read about Harry on his website: he was born in Hangzhou City on the east coast of China, attended Law School in Shanghai then in Chicago, and at the University of Saskatchewan and the University of British Columbia, where he received his Batchelor of Law degree in May 1951. Mr. Fan was the first Asian to graduate from a Canadian Law School. However, he had to work as a carpenter for 5 years to acquire residency and then citizenship before he could practice law. As well as practicing law Mr Fan has had a wide variety of business and charitable interests, including the Fan Tower which used to be known as the Stratford Hotel. It’s an interesting and perhaps surprising coincidence that the Empress was run by Walter Sandford while his wife built and operated the Hotel Stratford from 1912. More recently Mr Fan has interests in both properties, although this site is now offered for sale and seems like a good candidate for the rejuvenation redevelopment of parts of Chinatown that is slowly taking place. We’ve seen this building before – although in that post it was called the International Hotel (and it was about 40 years later). This VPL image is supposedly from 1900, but we think it’s more likely to be 1901 when the Duke and Duchess of Cornwall visited the city and toured in procession down Cordova – clearly the hotel and theatre were dressed up for something. We covered a great deal of the history of the theatre and the hotel in the earlier post. What we had failed to note was that the hotel went through what were described as ‘major alterations’ to the Hotel Quinte in 1906, designed by Dalton & Eveleigh. The same architects also designed $4,250 worth of alteration in 1911 for G W Crotts, the owner, who had also had an architect called E Dare design $1,000 of alterations a year earlier. J Williams also altered the hotel basement in 1911 at a cost of $2,000, so quite a bit of work was carried out in a relatively short time. George W Crotts seems to have avoided the 1911 Census (or been recorded with a different spelling), but he was in partnership with his brother, Charles, who was aged 29 and American, working as a broker in the real estate company of Crotts & Crotts based in office on West Hastings in 1911. Almost certainly they originally came from North Carolina – the name is unusual enough to limit the options, and the last time they appear in a Vancouver directory is 1916. In 1920 a George W Crotts was resident in Los Angeles, and a George W Crotts was born in Canada in 1913 whose father was similarly called George W, so from this we know that George’s wife was called Sirona, and there was a 16 year gap between George junior and his sister, Mary, who had been born in North Carolina. They seem to have done well, both Charles and George were first in the city in 1908; George was a millwright; in 1909 Charles was a machinist and George a woodworker in the CPR shops, and in 1910 Charles was in real estate, but George was still in the CPR workshops. George died in Los Angeles in 1931, and Sirona, (who was also born in North Carolina) also died there in 1958 when she was aged 78. Today the rebuilt Henriquez Partners Gastown parkade occupies the space, with the Vancouver Film School moving into the space in the lower and basement floors briefly occupied by the Storyeum historical experience. The Orange Hall was completed in 1907, although the announcement of its design by W T Whiteway was in 1903. The purpose of the Orange Order was to bring together the ‘Protestants’ of various denominations into one homogenous grouping to maintain their Protestant religion and way of life. The building’s main floor housed several businesses including a printers and Morgan Brothers Furniture, and upstairs were two floors; an assembly hall and above that a floor used for band practice. Although the 1903 announcement (and the first building permit for the foundations) were in 1903, the $30,000 project had made virtually no progress when a flurry of activity and a $45,000 permit saw the building completed in only four months. Our 1908 VPL image shows what it was like on completion – three storeys (and a basement) with curved Romanesque arches on the third floor. The Lodge saw falling membership in the 1930s, but they were able to carry on with the help of Jack Whelan who staged wrestling matches on the top floor on Wednesday and Saturday nights from 1935. Finally in 1944 the Lodge sold the building to the National Housing Administration who in turn hired W F Gardiner to rework the building as housing, with 27 suites. The work was quite dramatic – the top two floors became three, and the arches were lost. A post office occupied the main floor. Over the years the housing shifted from the public sector to the private sector, and most recently back into public ownership with its purchase by BC Housing. Our image shows it back in 1977, when it was holding up remarkably well, although recent restoration to the cornice looks a lot better. The building is one of a portfolio of 13 historic buildings in the city getting nearly $150 million in repairs, seismic upgrades and restoration (and work is not complete on this building). The housing is run by SUCCESS, a Chinatown-based organisation which is one of the largest social service agencies in British Columbia. Here’s another view of the Delmonico Hotel, this time in 1956 – (our earlier post of this building showed it in 1935). 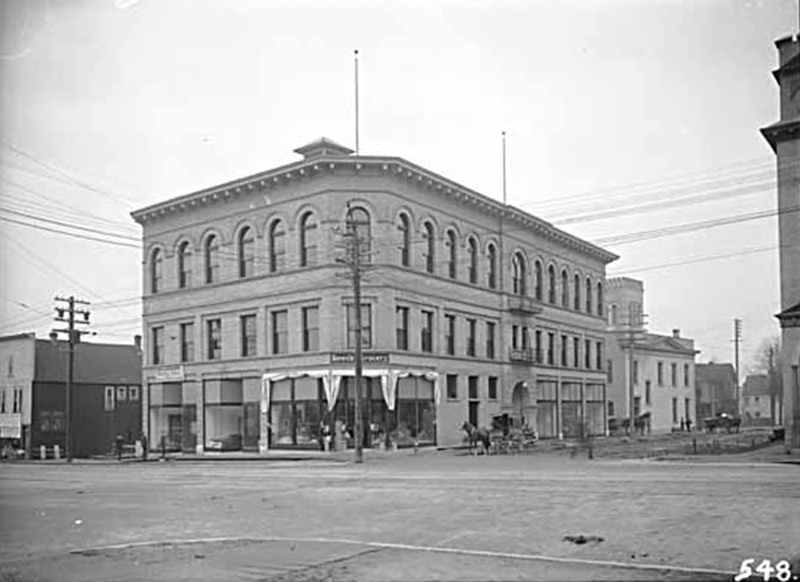 According to the Vancouver Daily World in 1892 it was built for the Marquis of Queensbury to replace the St. Charles Hotel. The Marquis was a Scottish aristocrat with an interest in boxing and noted for his atheism, which was relatively unusual for the time. We now know why he hired Fripp and Wills to design a new hotel – he owned the St Charles Hotel that was destroyed by fire in February of 1892, along with the Arlington Hotel that was next door. We originally thought he had built the new Delmonico on the same site as the St Charles, but we were wrong; the St Charles was on the south side of the street; the Delmonico was built across Pender Street. Or so we thought – until we noticed this image of the Windsor Hotel from 1889. It was on the corner of Pender and Seymour, run by H A Brocklesbury and W H Allen in 1890 and Ermatinger and Co in 1889. It’s clearly the same building that became the Delmonico, so the newspaper story iwas somewhat misleading. We haven’t found the developer or architect for the Windsor. Described as a ‘handsome brick and stone building’, the Delmonico was added to and altered by architect J W Mallory in 1900, in the year that T Donovan was proprietor. A number of long-term residents lived at the hotel that year, including C W Mullen who was the treasurer of the Savoy Theatre. In 1910 William Steele had the hotel, and there were still several residents listed in the street Directory. Like so many of the buildings we have looked at, the operators and the name change constantly. This is by no means a comprehensive study – just random examples. By 1915 the Delmonico name was being used by a cafe on Robson Street, and the residential part of the old Delmonico were the Terminal Rooms run by George Lamoureuc, upstairs from the Terminal Pool Room run by F Sim with two vacuum cleaner companies in the corner unit next door to the Gilt Edge Lunch. By 1920 the name had changed again, this time to the Mason Rooms, run by John Woolfe. The Pender Buffet was on the corner, run by Thomas Dixon. In 1930 they were the Manor Rooms with the Hollywood Taxi Co operating from the main floor with the Lions Gate Barbers Shop and central Shoe Repairs. They retained the Manor Rooms name all the way through to this 1956 image, when the Pagoda Shop selling ‘Oriental Goods’ was the retail tenant on the corner, as they had been from the early 1950s. Nick’s Billiards was next door on one side, a barbers and a dealer in foreign stamps on the other. The 1969 parkade that replaced the Delmonico (and the many other names over the years) is being repaired, so unlike so many of the city’s other parkades it looks as if it will have a few more years of life. Here’s a more recent view of the view west from Richards Street of the south side of West Pender. In a much earlier post we saw the buildings that were there in 1908. This 1980s picture, still before the Kingsley Lo designed parkade was built, shows how many had survived the intervening years. Almost all the buildings were unchanged over the 70 year gap. We’re wondering if the building on the corner might have been a very early one. In 1888 T Prest commissioned William Blackmore to design stores and apartments on Pender at Richards, and if they were built, this would quite possibly be them as the 1901 insurance map only shows this corner of Richards and Pender developed; in 1902 it housed the Chinese Mission. However, Fripp and Wills were also commissioned to build a commercial block for J.M. Spinks, R.G. McKay and Dr. Powell in 1892 also at Pender Street at Richards – so that’s a more likely candidate as it comes four years after the Prest commission. When he built the Pender Street investment Captain Pybus was already aged 58, although he had a younger English-born wife and two daughters, aged 16 and 20 in the 1911 census. He had been born in South Africa and although his biography suggested he had come to Canada in 1901 when he was 50, the 1911 census says it was 1890, which makes more sense. He was described not just as a sea captain, but as a Master Mariner. His reason for being in the US with the Tartar was to transport US troops involved in military operations in the Philippines. Once in Vancouver he commanded all three of the CPR ‘Empress’ line ships. The building (numbered today as 532 West Pender) still stands today, and looks very similar to when it was first built. We’re not completely sure when the Bridge Hotel was built, or who designed it. It was at 796 Westminster Avenue just before the bridge that headed south over False Creek, and John Austin was running it in 1888 and in 1889 he was running it as well as the Stewart House on Water Street. 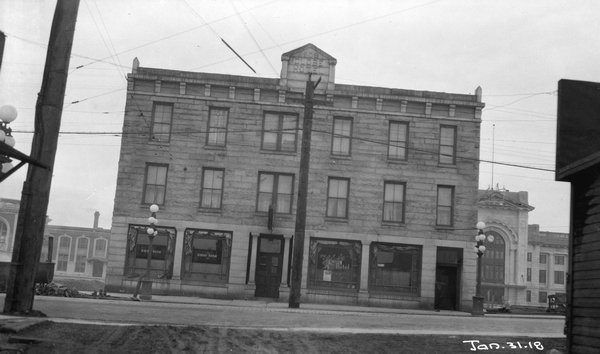 In 1907 the Bridge Hotel was listed at 1080 Westminster Avenue (following a comprehensive renumbering of the street) and was run by Cunningham & Chapman; Samuel G Cunningham and Alvin Chapman. The 1903 Insurance Map shows it having only 2 storeys, and was a woodframe structure. In 1908 it was renamed as the Globe Hotel, although Cunningham and Chapman still operated it. It was a new stone faced building, developed by Kelly and Murray at a cost of $35,000, although we don’t know the architect involved. In 1910 when our photograph was taken the five storey the VanDecar Hotel had appeared in the directory for the first time a little further to the north at 1038 Westminster Avenue. The plans for the building were probably drawn up in 1908, and the architect might have been John S Taylor. He was a Scot who arrived in Canada in 1905, aged 20, and worked in the CPR Offices until 1907, when he set up his architect’s office. If it is by him, the hotel is the earliest design we know to be associated with his work in Vancouver – he would have been only 23 when it was designed. Thomas Hooper designed a new iron canopy for the hotel entrance in 1909. The directory shows that in 1910 there were a number of residents living full time in the hotel. There was a lunch counter run by John Tomkins and a cigar stand by Thomas J Tomkins. The barber’s shop was run by Lee Vandermark, and there was a Pool Room run by Kimber and Entursette. Herbert VanDecar was the manager, with L Bates VanDecar of ‘VanDecar and sons’ living at the hotel (probably one of Herbert’s three sons). We assume this is the same L B VanDecar who ran the Royal Hotel in Cranbrook in 1905, with the slogan ‘Van always on hand to welcome guests’ and in 1907 moved to the Driard Hotel in Victoria. The other two brothers, Frank, and A B VanDecur weren’t listed in the Directory as living in the city. In that same year the Westminster Avenue bridge was rebuilt as a bascule bridge. From 1910 to 1912 Samuel Cunningham, from the Globe, was no longer in the city, (or at least not in the City Directory) but in 1913 he was back, owning the Hotel Cunningham which was the new name for the VanDecar. There’s no sign of any of the VanDecar family in the city that year, and L B seems to have moved on to Port Alberni. In 1920 the Globe was still in business; H Parkin was running it, and the street was now called Main Street. That year the Cunningham became the Ivanhoe with J G Scott running it, and Mrs Groves the housekeeper. There were a number of long-term residents including a carpenter, millwrights, a cook, a policeman, a diamond driller, the elevator operator at the Birks store, a miner and a welder. In 1923 the Globe disappeared, acquired by the City of Vancouver for the expansion of the False Creek Flats that had been filled in to the east. This 1918 picture shows it hanging on while the new station is built behind, but a few years later the new park was created in front of the station buildings. Today the Ivanhoe continues to welcome world travelers as a Backpacker’s hotel as well as offering long-term accommodation for permanent guests, just as it did when it was first built.